In 1996 the mayor of Three Forks, Gene Townsend, received his first grant from Fish, Wildlife, and Parks to begin creating a recreational trail around the Three Forks area. With the beginning grant and a 20% match from Luzenac, a local talc company, Townsend along with a local contractor began what has now become over eight miles of paved trail. Once the citizens of Three Forks and other organizations saw that the money was being put to good use more money started coming in. Townsend received a $25,000 grant from the Land and Water Conservation Fund, which was matched, and some money also came in from the Nature Conservatory. In addition a memorial fund has been created for people to dedicate places such as benches and plaques along the trail to loved ones. Mayor Townsend is designing the trail to be accessible for everyone, including people with disabilities. It is eight feet wide with a foot of shoulder on each side for easy accessibility. Places along the trail include 4 bathrooms, 13 benches, 4 picnic tables, and a number of doggy stations for convenience. All ages, including the elderly and handicapped, use the trail system. Residents say that they appreciate the flat terrain and the fact that there is very little vehicular traffic near most sections of the trail. For the kids there is a play fire truck along the trail which Townsend hopes is just the beginning of more destinations such as, perhaps, a climbing wall. A friend of Townsend’s plows the trail during the winter to allow for year-round use. Townsend has seen many people picking up trash, which has been very useful in keeping the trail system looking clean and well-maintained. Part of the trail comes straight off of the school track which has been very beneficial for the training of different sports teams, as well as for the rest of the kids to use for recreation and transportation. The trail also goes to the Headwaters State Park which allows people to bike or walk easily to enjoy the views. A trail is currently being created heading West of Three Forks and Townsend’s goal is to have a trail going all the way to Manhattan, as well as one to a nearby KOA campsite and the Jefferson River. Besides building the trails, Townsend and others are in the process of installing bridges to connect certain parts of the trail. He has also been working with the Montana Nutrition and Physical Activity Program, the Montana Disability and Health Program, and the Montana Independent Living Project to make the trail even more accessible to as many people as possible. This year the Headwaters Trail System completed a 140 foot bridge over the Madison River to connect the trail system to the Missouri River Headwaters State park. A paved parking lot for handicap trail users and mothers with strollers to access the trail was also created. 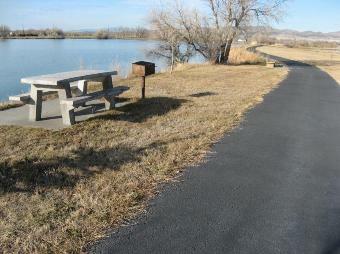 A small section of trail was built to connect the trail system to a newly constructed gazebo at the fishing access site. Over the summer and fall of 2012 the Headwaters Trail System, the City of Three Forks and the Montana DOT partnered on a section of trail that provides access to a new food market on the edge of Three Forks. This trail also connects the residents that live in this area and gives them better access to the city. At this time Mayor Townsend and the Headwaters Trail System crew are starting to push the trail in the direction of Manhattan with a small section of trail being built east of the Lower Madison County Road. Each year the Headwaters Trail systems grows and improves. The 2013 summer plans for the trail include paving an older section of the trail that has not yet been paved as well as paving the section of the trail that goes East towards Manhattan. The Headwaters Trail crew will also be adding more benches alongside the trail so users can stop, relax and enjoy the views. New signs will be put in place as well to help guide users along the paths. Posted in Active Living, Broadwater, Programs.